This is our third stop in a travel series called How to go from Etowah, TN to Etowah, TN in about six hours. 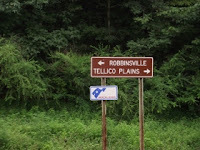 The next stop on our road trip loop was in Tellico Plains, TN. Getting there from Etowah was easy. Going out of town we followed the signs to the Cherokee National Forest and went right into Tellico Plains. Signs took us right to the visitors center. The visitors center is a large A-frame type building. It sits directly on the road and has plenty of parking. A large quilt square on the building marks its spot on the Quilt Trail. Staff at the center will be glad to tell you about that too. We found out that skyway is a designated National Scenic By-way with several interesting stops and side trips. It's easy to miss these out of the way places without a stop at the visitor center. 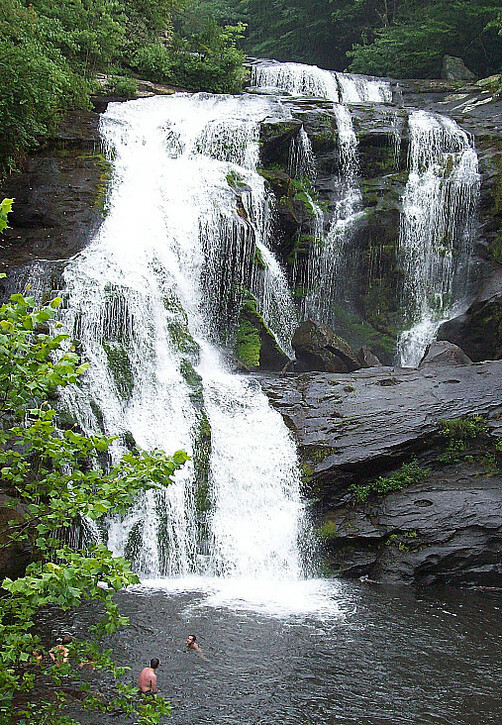 One of the prettiest waterfalls in the country is Bald River Falls. It is just off of the skyway. The side road runs directly in front of the falls. Visitors don't even have to get out of the car to get a good view! Camping isn't the only thing at Indian Boundary Campground. Their recreation area offers lake shore swimming and a boat launch. The well shaded picnic area is the perfect place to have your road trip lunch. We would never have known this without stopping here. They also advised to us buy gas here. The next station is until you cross the North Carolina Line on the skyway. The staff here was great to give us the tips and hints that add to the journey. Bald River Falls is one stop we wouldn't have known about without their help. Plus, where else can you buy books about the skyway, locally made items and cute stuffed black bears? We were glad we stopped by the Cherohala Visitor Center in Tellico Plains. It helped add an extra depth to our trip. The next thing we did was drive the amazing Cherohala Skyway.